Staff photo by Erin O. Smith / Catoosa County Chairman Steven Henry, center, speaks during the opening of a work session Monday, July 31, 2017, at the Catoosa County Colonnade in Ringgold, Ga. 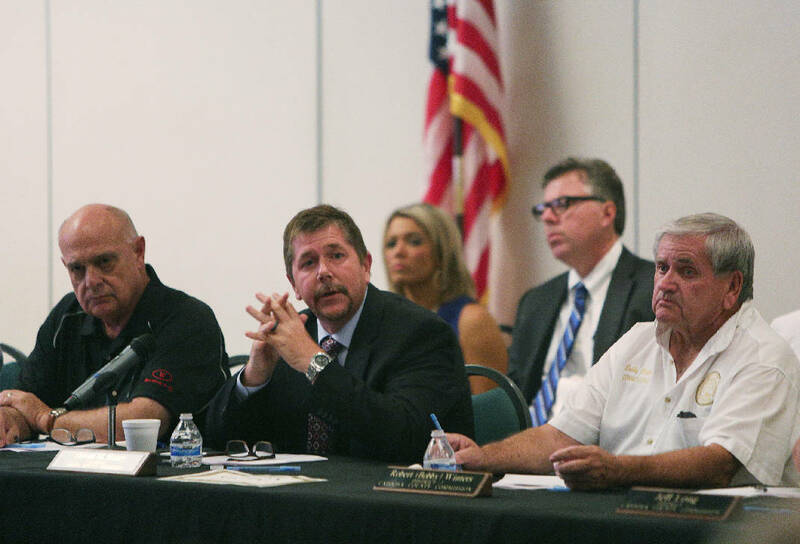 The Catoosa County Commission, Ringgold City Council and Fort Oglethorpe City Council held an Intergovernmental Work Session to discuss how to divide sales tax revenue, the state of the county jail and more. RINGGOLD, Ga. — Catoosa County officials hope to put a 1 percent transportation sales tax on a referendum in the March election, according to a timeline presented by County Manager Alicia Vaughn on Monday afternoon. 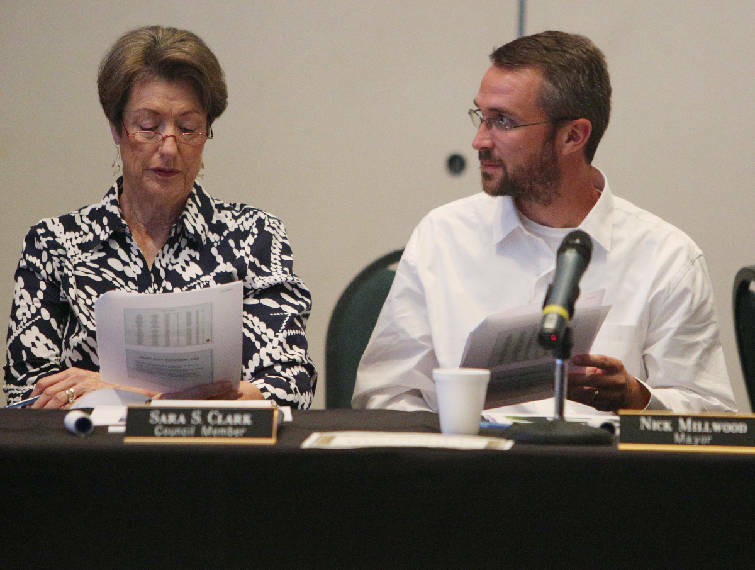 During an intergovernmental meeting, Vaughn, Fort Oglethorpe City Manager Jenny Simpkins and Ringgold City Manager Dan Wright agreed to begin negotiating how to share the money from the sales tax. They hope to have an agreement in place by the end of the year. Staff photo by Doug Strickland / Alicia Vaughn sits with her family during a Catoosa County Commission meeting at the Catoosa County administrative building on Tuesday, Aug. 21, 2018, in Ringgold, Ga. Commissioners voted unanimously to donate about 5 acres of land to the Catoosa County Board of Education. If approved by voters, the new transportation special purpose local option sales tax would go into effect in July. According to Georgia law, the money can be used on any transportation project, but the language is pretty broad. In addition to paved roads and repaired bridges, the money can be used on buses, buying rights of way and storm drains, for example. "We're not ready for the [population] growth," County Commission Chairman Steven Henry said. " ... We need to start planning ahead for what's coming." Over the last year, a similar 1 percent sales tax has generated about $860,000 a month for the three governments. But the transportation tax includes an exemption on motor fuel purchases. Kathleen Bowen, a legislative associate with the Association County Commissioners of Georgia, said this exemption means they will get about 10-15 percent less than they do with the other tax, giving them about $730,000-$775,000 a month to split between the two. During Monday's meeting, Vaughn proposed a split with the county getting 70 percent of the revenue. Fort Oglethorpe would get 20 percent under this proposal, and Ringgold would get 10 percent. Ringgold City Councilwoman Sara Clark told Vaughn she would rather get these details decided before presenting the potential new tax to voters in town hall forums. "We're not prepared to approve any of those numbers,"she said. "I think, going out to the citizens, they're going to ask, 'How much do we get?' For us to just say, 'We're part of Catoosa County, we don't know' gives a negative spin on passing something. I would rather give a positive spin on passing this and be able to actually ... speak positively about what we're doing and what percentage we're getting." Catoosa County Public Works Director Buster Brown said the local government has fallen behind on important maintenance. A good road will last about 20 years, he said. With 426 miles of county road, county workers should pave about 21 miles a year. But in the years before he arrived in 2011, Brown said, the county was paving five to seven miles a year. With some federal grants, the county has picked up work in recent years, but it is still short of the 21-mile-a-year schedule Brown thinks is necessary. Staff photo by Erin O. Smith / Ringgold Councilwoman Sara Clark and Mayor Nick Millwood talk during a work session Monday, July 31, 2017, at the Catoosa County Colonnade in Ringgold, Ga. The Catoosa County Commission, Ringgold City Council and Fort Oglethorpe City Council held an Intergovernmental Work Session to discuss how to divide sales tax revenue, the state of the county jail and more. But forget that, he said. Because they are so far behind, the county needs to pave almost 30 miles a year. Once they catch up, he believes, they can scale back to the more manageable figure. The cost on these projects can also vary. In some parts of the county, Brown said, previous workers did not build a foundation. While a good road should sit on 16 inches of rock, some smaller roads are essentially sitting on a bed of gravel. They might last only 6 years before they break apart, he said. "County roads just aren't propped up," he said. "They didn't do that back in the day." To rebuild those and make them last, Brown said, the price tag is about $400,000 a mile. Thirteen Georgia counties now have a similar transportation sales tax, including Walker County, where voters approved the tax last November. In Dade County, voters rejected referendums to add the tax twice, last November and again in May.